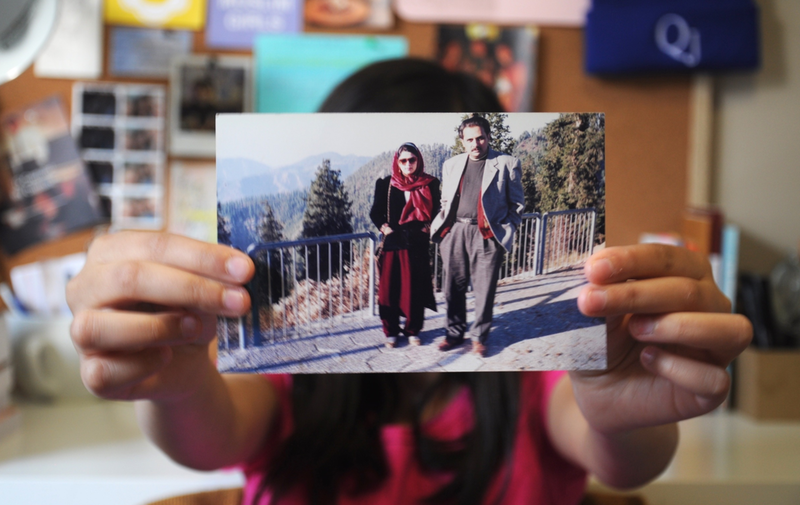 Most of my memories from my time in Pakistan, those first four years of life, are blurry and out of focus. In between dull, drowned voices and a few wobbly home movies, I can remember the occasional sipping of cooled chai from saucers. I can remember Mama’s young hands and her cropped hair, the lush garden of her family home, the scattering of lizards across the flat concrete roof, but not much else. Those four years in Pakistan—spent clinging to my mother’s khameez in the thicket of dusty Gujrat City, Punjab—were the last I’d spend there before boarding a one-way plane to Toronto. I landed in Canada just under two months after the Twin Towers fell. I didn’t know it then, but there was more than just the sharp November wind in the air upon my arrival. There was also brewing the violently renewed and multiplied fear of brown people. I didn’t know it then, but I would spend the next decade rejecting my brownness and wanting loudly and proudly to be white, seeking the validation of my new countrymen until I realized it just wasn’t possible. Until I realized that being “enough” was a bar being endlessly, infinitely raised. I spent half a lifetime forgetting. And now, I’m working hard to displace that energy—a lot of energy—with remembering, actively recapturing, and consistently embracing my South Asian, Muslim heritage. My childhood passed in a flurry of tirelessly convincing others of my duality. Two lives, the heroic and attractive white and the orthodox and oppressive brown, lived next to one another but never crossing, kept mutually exclusive at all times. Now, I’m on a long and healing path of giving into my complexity: a largeness of identities, always crossing paths and falling into one another, the brown being the largest and proudest among all. This recapturing, it’s worth it. But it’s hard. It’s really hard. In the fourth grade, my best friend’s name was Melanie. She had silky blonde hair and blue eyes and her cheeks would turn the colour of pink bubblegum in the harsh Canadian winter. When I invited her over to our townhouse in the suburbs for the first time, I wanted more than anything to convince her of my family’s normalcy. Look at our cupboard full of Cheetos and canned peas! And my rhinestoned jeans and baggy crewneck and MTV still left playing on my television! Nothing exotic here! That night, she called her mom to let her know she’d be having dinner with us. Mama had cooked a household Pakistani recipe: a thick, pungent okra curry with beef and boiled rice. The smell of spices that is so familiar to South Asian households ballooned in my home. In the hour of waiting for dinner to be set on the table, I bit my nails to the quick. “It looks like garbage,” said Melanie, contorting her small, doll-like features at the generous mound of curry that Mama had ladled onto her plate. She laughed. I could feel the lump in my throat grow tenfold as I laughed along with her. The food our parents grew up eating and now made so lovingly for us, theparathas and rotis and naans carefully rolled out, the fingers burned on hot pans in the process, this food was overflowing with flavour and love and the stories of our homeland. It was the purest form of wanting the best for their child, being reminded of their searing sacrifice with every curry and spice and untranslatable word. And yet, countless times, I remember shaking my head and crinkling my nose and asking for something normal, something not brown. Today, I opened my lunch I had packed for work and microwaved my Mama’s curry and the scent of it filled the office, where I work with a dozen other people. I can tell you it doesn’t make me nervous anymore, such a loud act of brown self, but I still bite my nails with anxiety to “fit in” some days. Most days, though, it makes me proud—these gestures of brownness, these acts of leaning into my self-complexity—and this is my small but whole-hearted rebellion. I started CherishChai.com in November of last year to pave a space where I could map this difficult journey to actively recapture my Pakistani, Muslim heritage after years of repressing and neglecting it as a kid. Cherish Chai captures me as I try my very hardest to live as myself in all my cultural forms, as belonging to no one country at once, with dualities and layers in my everyday life that transcend continents and languages and generations. Hopefully, it captures how, above all, I am unapologetically and deeply in awe of my brown womanhood and all the power it holds. Sometimes, I’m afraid I’m now known as the “brown girl with the brown blog” among my circle of Facebook friends. Sometimes, I’m worried I shouldn’t put Cherish Chai on my resume for fear that future employers will think I’m “too brown” for their jobs. Running a blog on my culture and identity doesn’t immediately immunize me from the lasting trauma and self-doubt of the diaspora. But it’s a step forward if ever there was one. Just as the four-year old me, still living in Pakistan and teetering on the edge of a continent-sized shift, couldn’t fathom the change ahead, the middle-schooler me would never have imagined this. The middle-schooler me — with her Pakistani dresses crumpled in the back of her closet and hours in the Walmart makeup aisle picking a foundation several shades lighter than her skin—would never have imagined that at 19 years old, I would be so proudly and so defiantly brown. The sheer warmth of remembering almost makes up for the irrevocable cost of all those years spent forgetting. Ramna Safeer is the Editorials Editor at The Queen’s Journal and the founder and blogger at CherishChai.com. She is a writer, activist and avid coffee-spiller.